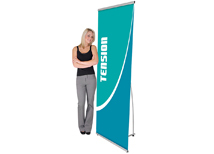 Spring back banner stands are the most basic portable banner display. The hardware consists of graphic rails and stabilizing poles that hold a high quality graphic banner. We offer multiple sizes to fit any marketing requirement. The low price point makes these banners very affordable while the quality components will keep them functional for years of use! Size - 31" x 77"
We offer a large selection of spring back banners that are designed for portable use. Every stand breaks down for easy shipping. The Spring line is an economy product that is designed for light duty use, out of all the economy banners available the Spring continues to offer the best value for the price. The Uno line is designed for long term, heavy duty use and has proven itself as one of the best spring back banners available. All of our graphics are produced in three business days and hardware can ship same day!